Source: Finished copy provided by the publisher in exchange for a fair and honest review. Before reading Lead Me Not, I'd only read one book by A. Meredith Walters---Reclaiming the Sand. It broke my heart but I loved it. The topics within were in no way happy, but I had (and still HAVE) such fond feelings for that story. It was my experience reading, and loving, that book that gave me the courage to pick this one up. We all have topics we just cannot deal with reading. For me, cheating sets me off (most of the time), and so does addiction and drugs. If I know beforehand that a book is dealing with those topics, I'll usually steer clear. But then there was this book. This pretty-looking book, with that interesting synopsis. And it's by A. Meredith Walters. The author that took such great care with difficult topics in Reclaiming the Sand. The author that made me love that book. 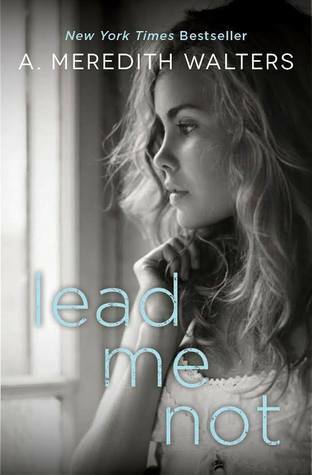 Lead Me Not is not a happy novel. It's dark and gritty. It weighs on you with each page you turn. But in reading this book and turning those pages, it pulls you in and takes you along for this story... this story that drags you through rock bottom and spits you out with at least a little hope. And I enjoyed this story. Throughout the entire book, Maxx is going through his rock bottom. He's low, and he hits that deepest low lots of stories graze. It was a painful experience watching him sink and grapple with what was right---but falling to his addiction again and again. He was a hard character to like. But in watching him go through his struggles, it grows easier to root for him. But while it grows easier, it also hurts more and more. But, as I said, in the end, there is some hope. Throughout the entire book, Aubrey is trying to help. She's trying to make up for the past in the only way she knows how---aiding Maxx in rising above his addiction. Obviously, she didn't truly have anything to prove to anybody, but her efforts were respectable. I also praise her for standing up for herself when it's time. For stepping back. For pushing Maxx to the point where that little bit of hope I keep talking about is possible. The writing of this book is phenomenal. So much emotion. It is literally a punch to the heart. The biggest strength in this story is how it makes you care. You start reading about Aubrey and Maxx and you want them to be okay. You want them to work out and be happy. And then you go through the entire roller coaster of this book with them... And then you leave with that dash of hope. As for romance, which I haven't mentioned much of---out of the ordinary for me, I know. The romance is there. It's part of what made me care so much for the characters. I wanted them to be able to be happy. For Maxx to overcome his addiction and Aubrey to not have to relive her past again by watching Maxx. I'm definitely rooting for this couple. I was with them for this book, and I'll stand by them for the next one. In the end, I enjoyed this novel. It was a difficult, painful experience to read, but in my opinion the ending is worth it. I can't wait to pick up the second book and see where everything goes next. Hopefully things are looking up. 4 stars - A dark, gritty novel that breaks your heart and leaves you with a glimmer of hope for what's to come next.